1. Kai Li. Li, Yang. Ying Wang. Feng He. Menggai Jiao. Tang, Hao. Zhijian Wu*. The oxygen reduction reaction on Pt(111) and Pt(100) surfaces substituted by subsurface Cu: a theoretical perspective J MATER CHEM A, 2015, 3(21): 11444-11452. 3. Jun Wang. Kai Li. Haixia Zhong. 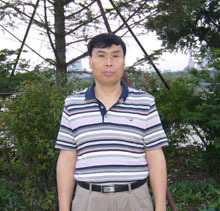 Dan Xu. Zhongli Wang. Jiang, Zheng. Zhijian wu. Xinbo Zhang*. Synergistic Effect between Metal-Nitrogen-Carbon Sheets and NiO Nanoparticles for Enhanced Electrochemical Water-Oxidation Performance.ANGEW CHEM INT EDIT, 2015, 54(36): 10530-10534. 4. Menggai Jiao. Kai Li. Guan, Wei. Ying Wang*. Zhijian wu*. Page, Alister. Morokuma, Keiji. Crystalline Ni3C as both carbon source and catalyst for graphene nucleation: a QM/MD study.SCI REP-UK, 2015, 5: 12091. 5. Menggai Jiao. Kai Li. Ying Wang*. Zhijian wu*. Quantum Chemical Molecular Dynamics Studies of Bilayer Graphene Growth on a Ni(111) Surface.J PHYS CHEM C, 2015, 119(22): 12643-12650. 6. Feng He. Kai Li. Xie, Guangyou. Ying Wang. Menggai Jiao. Tang, Hao. Zhijian wu*. Theoretical insights on the influence of doped Ni in the early stage of graphene growth during the CH4 dissociation on Ni-Cu(111) surface.APPL CATAL A-GEN, 2015, 506: 1-7. 7. Zu, Ningning. Wang, Jing. Ying Wang*. Zhijian wu*. Half metallicity in Sr2CrOsO6via Na doping.J ALLOY COMPD, 2015, 636: 257-260. 8. Liu, Yuqi. Gahungu, Godefroid. Sun, Xiaobo. Ying Wang. Zhijian wu*.Quantum Chemical Investigation on Phosphine-Functionalized Charge-Neutral Osmium(II) Complexes Bearing Bidentate/Tetradentate Pyridylpyrazolate-Based Ligands.EUR J INORG CHEM, 2015, (20): 3290-3298. 9. Si, Yanling. Zhang, Shuai. Gahungu, Godefroid. Yang, Jinghai. Zhijian wu*. Modification of the emission colour and quantum efficiency for oxazoline- and thiazoline- containing iridium complexes via different N-boolean AND O ligands+.RSC ADVANCES, 2015, 5(24): 18464-18470. 10. Wang, Jing. Hao, Xiangfeng. Xu, Yuanhui. Li, Zhiping. Zu, Ningning. Zhijian wu. Gao, Faming. Cation ordering induced semiconductor to half metal transition in La 2 NiCrO6.RSC ADVANCES, 2015, 5(63): 50913-50918. 11. Xingxing Yang. Zuoling Fu. Guofeng Liu. Zhang, Chunpeng. Wei, Yanling. Zhijian wu. Sheng, Tianqi. Controlled morphology and EDTA-induced pure green upconversion luminescence of Er3+/Ho3+-Yb3+ co-doped NaCe(MoO4) 2 phosphor.RSC ADVANCES, 2015, 5(86): 70220-70228. 12. Si, Yanling. Zhang, Shuai. Qu, Nan. Luan, Guoyou. Zhijian wu*. Enhancing the electronic properties and quantum efficiency of sulfonyl/phosphoryl-substituted blue iridium complexes via different ancillary ligands.NEW J CHEM, 2015, 39(5): 4147-4153. 13. Zhang, Xiaozheng. Zhao, Erjun. Zhijian wu*. Prediction of new high pressure phase of TaB3: First-principles.J ALLOY COMPD, 2015, 632: 37-43. 14. Li, Huaiyong. Zhijian wu. Shihong Zhou. Siyuan Zhang*. Pu, Xipeng. Yao, Shujuan. Wang, Xiaoqing. Yin, Jie. A crystal chemical study on the superconductivity and compressibility of LnFePnO (Pn = P, As) superconductors.J ALLOY COMPD, 2015, 632: 303-306. 15 .Xingxing Yang. Zuoling Fu*. Yang, Yanmin. Zhang, Chunpeng. Zhijian wu. Sheng, Tianqi. Optical Temperature Sensing Behavior of High-Efficiency Upconversion: Er3+-Yb3+ Co-Doped NaY(MoO4)2 Phosphor.J AM CERAM SOC, 2015, 98(8): 2595-2600. 16. Linlin Fu. Zuoling Fu*. Yu, Yingning. Zhijian wu. Jeong, Jung Hyun. An Eu/Tb-codoped inorganic apatite Ca5(PO4)3F luminescent thermometer.CERAM INT, 2015, 41(5): 7010-7016. 17. Linlin Fu. Xingxing Yang. Zuoling Fu*. Zhijian wu. Jeong, Jung Hyun. Hydrothermal synthesis and tunable luminescence of CaSiO3:RE3+(RE3+ = Eu3+, Sm3+, Tb3+, Dy3+) nanocrystals.MATER RES BULL, 2015, 65: 315-319. 18. Xingxing Yang. Zuoling Fu*. Zhang, Chunpeng. Zhijian wu. Sheng, Tianqi. EDTA-mediated morphology and tunable optical properties of Eu3+-doped NaY(MoO 4 ) 2 phosphor.J MATER SCI-MATER EL, 2015, 26(9): 6659-6666. 19. Zu, Ningning. Wang, Jing. Ying Wang. Zhijian Wu*. Insulator-half metal transition driven by hole doping: a density functional study of Sr-doped La 2 VMnO 6 DALTON T, 2014, 43(23): 8698-8702. 20. Liu, Yuqi. Sun, Xiaobo. Ying Wang*. Zhijian Wu*. The influence of numbers and ligation positions of the triphenylamine unit on the photophysical and electroluminescent properties of homoleptic iridium(Ⅲ) complexes: a theoretical perspective DALTON T, 2014, 43(31): 11915-11924. 21. Godefroid, Gahungu. Liu Yuqi. Si Yanling. Su Juanjuan. Qu Xiaochun. Shang Xiaohong. Zhijian Wu*. Enhancing the blue phosphorescence of iridium complexes with a dicyclometalated phosphite ligand via aza-substitution: a density functional theory investigation J MATER CHEM C, 2014, 2(39): 8364-8372. 22. Kai Li. He, Chaozheng. Menggai Jiao. Ying Wang*. Zhijian Wu*. A first-principles study on the role of hydrogen in early stage of graphene growth during the CH4 dissociation on Cu(Ⅲ) and Ni(Ⅲ) surfaces CARBON, 2014, 74: 255-265. 23. Menggai Jiao. Qian, Hujun. Page, Alister. Kai Li. Ying Wang*. Zhijian Wu*. Irle, Stephan. Morokuma, Keiji. Graphene Nucleation from Amorphous Nickel Carbides: QM/MD Studies on the Role of Subsurface Carbon Density J PHYS CHEM C, 2014, 118(20): 11078-11084. 24. Si Yanling, Sun Xiaobo,Liu Yuqi, Qu Xiaochun,Wang Ying*,Wu Zhijian*,A DFT/TDDFT study on the effect of CN substitution on color tuning phosphorescence efficiency of a series of Ir(Ⅲ) complexes phosphine-silanolate ligands,Dalton Transactions,2014,43,714-721. 25. Wang Ying,Alister J.Page,Li Hai-Bei,Qian Hu-Jun,Jiao Meng-gai,Wu Zhijian,Keiji Morkuma*,Stephan Irle*,Step-edge self-assembly during grapene nucleation on a nickel surface:QM/MM simulations , Nanoscale,2014,6,140-144. 26. Liu Xiaoting,Zhang Jilong,Li Kai,Sun Xiaobo, Wu Zhijian*,Ren Aimin,* Feng Jikang New Insights into Two-Photon Absorption Properties of Functionalized Aza-BODIPY Dyes at Telecommunication Wavelengths: A Theoretical Study, PCCP,2013,15,4666-4676. 27. Tong Jing,Wu Di,Li Ying,WangYing,* Wu Zhijian,* Superalkali character of alkali-monocyclic (pseudo)oxocarbons clusters, Dalton Transactions,2013,42, 9982-9989. 28. Liu Yuqi,Sun Xiaobo,Gahungu Godefroid,Qu xiaochun, Wang Ying,* and Wu Zhijian,*DFT/TDDDFT investigation on the electronic structures photophysical properties of phosphorescent IrⅢ) complexes conjugated/non-conjugated carbene Ligands,Journal of Materials Chemistry C, 2013, 1,3700-3709. 29. Wang, J. Zhijian Wu*. Half metallic character of NiMoO 3 driven by the electron correlation and spin-orbit coupling APPL PHYS LETT, 2012, 101(4): 042414. 34. Cheng, Lin. Wang, Jinping. Wang, Meiyan. Zhijian Wu*.Theoretical studies on the reaction mechanism of alcohol oxidation by high-valent iron-oxo complex of non-heme ligand PHYS CHEM CHEM PHYS, 2010, 12(16): 4092-4103. 35. Cheng L., Wang J. P., Wang M. Y., Wu Z. J .,* Theoretical studies on the reaction mechanism of oxidation of primary alcohols by Zn(II)/Cu(II)-phenoxyl radical catalyst, Dalton Transactions, 3286-3297(2009). 36. Wang M. Y., Cheng L., Hong B., Wu Z. J .,* Reaction mechanism of palladium-catalyzed silastannation of allenes by density functional theory, Journal of Computational Chemistry, 30, 1521-1531(2009). 37 Song W. Y., Zhao E. J., Meng J., Wu Z. J .,* Near compensated half metal in Sr 2 NiOsO 6 , Journal of Chemical Physics, 130, 114707(2009). 38. Xiang H. P., Wu Z. J .,* Ab initio study on the electronic, magnetic and mechanical properties of CaCu 3 V 4 O 12 , Inorganic Chemistry, 47, 2706-2709(2008). 39. Wang M. Y., Cheng L., Wu Z. J .,* Theoretical studies on the reaction mechanism of platinum-catalyzed diboration of allenes, Organometallics, 27, 6464-6471(2008). 40. Wang M. Y., Cheng L., Wu Z. J .,* Theoretical studies on the reaction mechanism of palladium(0)-catalyzed addition of thiocyanates to alkynes, Dalton Transactions, 3879-3888(2008). 41. Zhao E. J., Wu Z. J .,* Electronic and mechanical properties of 5d transition metal mononitrides via first-principles, Journal of Solid State Chemistry, 181, 2814-2827(2008). 42. Xiang H. P., Liu X. J., Zhao E. J., Meng J., Wu Z. J .,* Ferrimagnetic and half-metallic CaCu 3 Fe4O 12 : Prediction from first principles investigation, Applied Physics Letters, 91, 011903(2007). 43 Zhijian Wu*. Zhao, Er-jun. Hongping Xiang. Xianfeng Hao. Xiaojuan Liu. Jian Meng. Crystal structures and elastic properties of superhard IrN2 and IrN3 from first principles PHYS REV B, 2007, 76(5): 054115. 44. Wu Z. J .,* Wang M. Y., Su Z. M.,* Electronic structures and chemical bonding in diatomic ScX to ZnX (X=S, Se, Te), Journal of Computational Chemistry, 28, 7-3-714(2007). 45. Wu Z. J .,* Su Z. M., Electronic structures and chemical bonding in transition metal monosilicides MSi (M=3d, 4d, 5d elements), Journal of Chemical Physics, 124, 184306(2006). 46. Xiang H. P., Liu X. J., Wu Z. J .,* Meng J., Influence of Mn-O-Mn bond angle on the magnetic and electronic properties in YBaMn2O5, Journal of Physical Chemistry B, 110, 2606-2610(2006). 47. Wu Z. J . *, Density functional study of AuXq (X=O, S, Se, Te, q=+1, 0, -1) molecules, Journal of Physical Chemistry A, 109, 5951-5955(2005). 48. Wu Z. J .,* Zhang H. J.,* Meng J., Dai Z. W., Gan B., Jin P. C., Structural stability and electronic state of transition metal trimers, Journal of Chemical Physics, 120, 4699-4704(2004). 49. Wu Z. J .,* Shi J. S., Zhang S. Y., Zhang H. J., Density-functional study of lanthanum, ytterbium and lutetium dimers, Physical Review A, 69, 064502(2004). 50. Wu Z. J ., Ban F., Boyd R. J.,* Modeling the reaction mechanism of amide hydrolysis in an N-(o-carboxybenzoyl)-L-amino acid, Journal of American Chemical Society, 125, 6994-7000(2003). 2、无机功能材料的理论研究与性质预测，2012年获吉林省科技进步一等奖 武志坚. 张思远. 孟健. 高发明. 周誓红. 付作岭. 李玲. 宋卫余. 项红萍. 赵二俊. 郝险峰. 李怀勇. 师进生. 王静. 吕术慧. 4、新型稀土杂化及纳米复合光电功能材料的基础研究及应用探索，2010年获国家自然科学二等奖 张洪杰. 武志坚. 张思远. 苏锵. 5、 稀土有机-无机杂化及纳米复合材料的制备、组装和性能研究，2007年获吉林省科技进步一等奖 张洪杰. 于江波. 孙丽宁. 施伟东. 李焕荣. 郑佑轩. 王成. 武志坚. 逯乐慧. 闫冰. 符连社. 彭春耘. 高书燕. 周亮. 李斌.